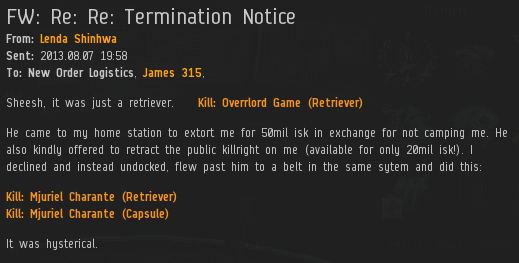 Highsec miner Overrlord Game put some tank on his Retriever, but not enough. If you're going to mine in a Retriever in a manner consistent with the Code, you can't greedily spend two lowslots on mining yield mods instead of tank. Agent Lenda Shinhwa busted into the asteroid belt like the hero he is and killed Overrlord. A bit of research turned up evidence that Overrlord is a real sweetheart. 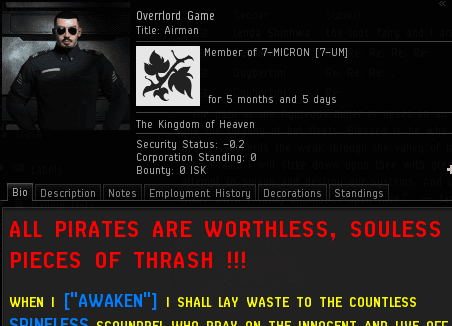 He claims to be a lowsec anti-pirate. Naturally, he spent his days mining ore in highsec belts. A responsible Agent always, Lenda filed the appropriate paperwork and notified Overrlord of his loss--since the carebear was probably AFK at the time. Lenda also gave him a good-natured ribbing about the anti-pirate image he was trying to cultivate. Overrlord vowed revenge. There was no place he wouldn't travel to follow Lenda, and no lengths to which he would not go to exact vengeance. 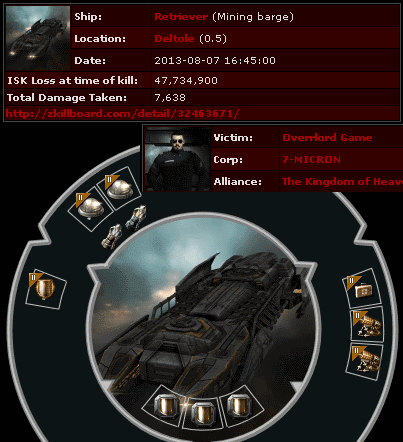 Lenda's days of moving freely about highsec were over. Overrlord's would be an epic story of retribution. To speed up the revenge story, Lenda sent him his current location. Tempting fate! Unfortunately, Overrlord Game's story didn't go entirely as planned. He was able to follow directions and report to Lenda's station, but he incapable of camping him. Instead, he got to watch as Lenda left the station and continued killing miners at will. Overrlord promptly gave up his revenge quest. 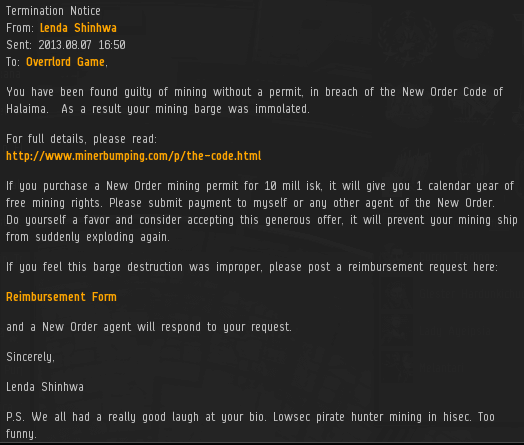 Perhaps one of those miners was really a lowsec pirate hunter? One can never tell these days. Yet it never gets old. Maybe one day someone will find a carebear mining in highsec that is actually intelligent. But it is not this day. Your comments, being as stellar and well thought out as they are, will dissuade multitudes to put this blog down and never come back. What religious trash. Burn the church and its priests. #1 yep, another noncompliant afk MMO player forced to interact with the rest of the players in the...MMO. sorry people who think playing a game actually involves PLAYING the game bores you. sorry this isnt as exciting as doing laundry, or watching youtube videos while your ship explodes unbeknownst to you in the background. #2 is that why youre still here? the stellar and well thought out comments dissuaded you to put this blog down and never come back? I really like hunting on weekend. Hope that when I come there, I can enjoy the interesting hunting and discovering this awesome place.